Only partway through, but that Sontaran nurse is cracking me up. 'Sontaran Children's Hospital' spinoff needs to happen. I liked the part when he claimed he could produce the finest milk in the universe, and slammed his (sontaran) breasts. I think the reveal was as good as it could be. Moffat could only really say she was the Doctor (two doctors interacting with each other), Amy's Child, another timelord (but then how did the doctor not know?) or the Doctor's Mother Which I think would be less of a cliffhanger than what it was. So it was obvious but it was the only one that makes sense. also, how did you guys know about Jack the Ripper London? I had no idea what you guys were talking about everytime you mentioned that! We'll probably be seeing Lorna (the girl who met the Dr as a kid). I did like her character. She said she was from the Gamma Forests, and River said something about her name not being in the language of the Gamminians (Lol?) "only water in the forest..". Anyway, it makes me assume the Dr would be dropping young River off there, and she grows up there, since they seem to know a bit of her. 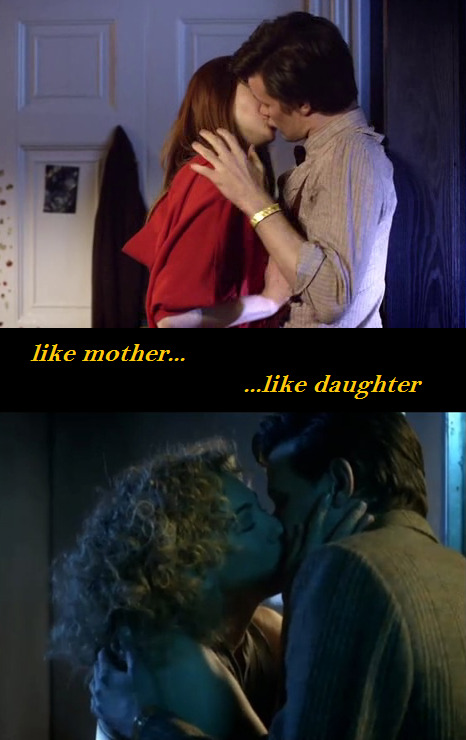 maybe the doctor and river can repopulate the whole of gallifrey! What's a gamma forest? that isn't the forest we saw in flesh and stone is it? I'm still on such a hype. That was awesome. Although I probably should calm down because I have to get up early in the morning! I'd really facepalm if we saw Lorna backwards like River Song. Then. It was River's baby. Or will be someone different. Or is that why she said "of course" while aimlessly shooting at her. Or did the Doctor wipe her memory clean. aaaaahhhhh I thought this episode would clear everything up. Just put it down to "Wibble-y Wobble-y Time-y Wime-y" and all problems are solved! An older River who'd just been on a date with an older Doctor but they wouldn't be dating until the Doctor was a little further on in the timeline, but then that means the River is older, and not younger which means that kiss was no the last kiss. But then wouldn't she be a younger River? What's a gamma forest? that isn't the forest we saw in flesh and stone? It's where the Lorna girl came from. The one who handed Amy that piece of cloth thing with Melody's name in her language. I did. Definitely. I want to see that Kovarian ***** get it. but did you see the red reference, did ya? You could be right. The doctor lies.